The first mini-challenge has been completed! Since the last time I read a play was back in high school, I decided to start with challenge #2 - simply to read a play. Henrik Ibsen (1828-1906) was a Norwegian playwright often referred to as the father of the modern drama. His play A Doll House (1879) has been characterized as "a scathing criticism of the blind acceptance of traditional roles of men and women in Victorian marriage". At just over 70 pages, this is a short three-act play and I hesitate to reveal much more of the plot. It's pretty mild stuff when measured against today's standards, but it's easy to understand why it was considered scandalous at the time. Reading a play was a welcome change of pace and I will not wait another thirty years before reading another, but they probably won't become a regular part of my literary diet. To be different, today, I’d love to see a discussion here, in the comments, rather than scattered amongst all our separate blogs. Because this is an issue that affects ALL of us, and I’d really like to see us hash out the merits and demerits of this evolution. What a timely topic for today's BTT! After reading the article in TIME magazine, I mailed it off to my college freshman daughter (old-fashioned, I know, but she likes receiving mail). She has dreams of a career in journalism/publishing and earlier this month attended "A Day of Publishing" in NYC. While there, she visited Random House, McGraw-Hill, and Conde Nast Publications. There is no question that the publishing industry will be changing, but I believe the industry is far from doomed. Connotations associated with self-publishing may also be changing, but I have to believe the success stories mentioned in the article are far from the norm. The rise in the popularity of the Japanese cell phone novels is an interesting phenomena that I'd heard about before. I am struck by the similarities to Dickens serialized novels of the 1800's...a rapidly developing story that quickly reaches its readers and leaves them anxiously awaiting the next installment. It will be fascinating to see how this evolves. As far as the ebook readers go, I am intrigued with amazon's kindle but haven't taken the plunge and purchased one. Reading on a computer screen hasn't worked well for me. I've attempted reading with DailyLit a couple of times and have given up within a week each time. If I traveled more, I'd probably purchase a kindle, but, for me, there is no replacement for the feeling of holding a book. 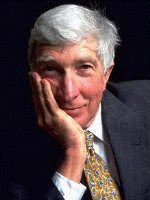 John Updike died yesterday, at the age of 76, of lung cancer. The New York Times obituary has a brief overview of his career. Updike was an incredibly prolific author, and one that I always meant to read more of. My introduction to his work came in late high school with a short story or two, but it was 20 years later, in 1997, that I became a fan. With our youngest children off to nursery school, the moms of playgroup decided to become a book club. We chose Updike's In The Beauty of The Lilies as an early selection and I was hooked...the sentences, the vocabulary, the insights. It was one of my favorite books that year. Since then, I've enjoyed John Updike's essays and reviews in The New Yorker, but have yet to read another novel. I did listen to Villages on CD in 2004 and was underwhelmed, but attributed it to the audio format. Brazil and Rabbit, Run sit unread on my shelves. In The Beauty of The Lilies is still there, too, awaiting a reread. Additionally, I'd planned to read The Witches of Eastwick last summer, in anticipation of the release of The Widows of Eastwick. At least three more of Updike's novels are on my Amazon wish list. It saddens me that there will be no new novels, or essays, or reviews in the New Yorker, but John Updike leaves behind a body of work vast enough to keep readers reading for a long, long time. Olive Kitteridge. Remember that name...we'll surely be hearing it again. It has recently been named a National Book Critics Circle Award finalist (the full list is here) and I'm predicting we'll also see it on many of the lists we bloggers churn out at the end of the year. What is it about Olive? She is not a particularly likable character, yet I can't stop thinking about her. Perhaps it's that I see something of myself in her...pragmatic, sometimes impatient and short-tempered, but also compassionate and insightful. The stories follow Olive over time from a young wife and mother to a 70-something grandmother, and evoke a full range of emotions as her character unfolds. There were many, many other passages just as lyrical and insightful. I loved this book, beautifully written with such brutal honesty, about what it is to be human. This will complete mini challenge #1 (read a collection of short stories and blog about it) of the 2009 mini challenges. What Type Is Your Blog? Well... maybe, but I'm not so sure about the adventure and risk part. Wally Lamb is a master storyteller. Just a few pages into his new novel, The Hour I First Believed, it was obvious that he's done it again. The novel centers around Caelum Quirk, a 47-year-old high school English teacher, and his third wife Maureen, a school nurse, both of whom work at Columbine High School in Littleton, Colorado. Maureen is at school during the infamous shootings of 1999, while Caelum is back in Connecticut dealing with the illness of an aunt who helped raise him. After a brutal description of the shootings, the couple tries to pull their lives back together. Maureen (and Caelum, to a lesser extent) struggles with the effects of PTSD and Caelum uncovers a mystery as he pieces together several generations of family history. These fictional characters are woven into the fabric of the 21st century (9/11, Hurricane Katrina, the war on terror), while Caelum's ancestors attend a dinner party at the home of Mark Twain, are present at the dedication of the Statue of Liberty, and take part in the Rheingold Girl competition. Lamb sprinkles the text with e-mails, a medical questionaire, newspaper articles, a dissertation, and many letters as the story moves along. I was also impressed with his ability to shift the narrative voice, so easily and convincingly, to the 12-year-old Caelum in chapter 4. This novel deals with topics of family relationships and ancestral "pull", psychology, mythology, chaos-complexity theory, as well as strong themes of spirituality. There is just SO much here, that it probably could have been TWO novels. I got a little bogged down around page 400, but that is only a minor complaint. All of the pieces together build to an extremely powerful ending - the first book in a long time that's made me cry. patterns and dead ends of their pasts, and a way out." 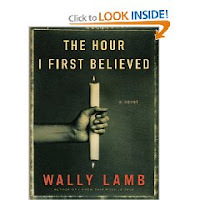 I have enjoyed all three of Wally Lamb's novels, and hope I don't have to wait ten years for the fourth. My rating for The Hour I First Believed is 4.5/5 . I've been thinking about soup all week. With today's single-digit temperatures and an overbooked evening schedule, this is the day! Family dinners are important to me, but a big pan of Corn and Sausage Chowder on the stove and a loaf of fresh bread on the counter will be just perfect tonight. This is a recipe I've been making for years. 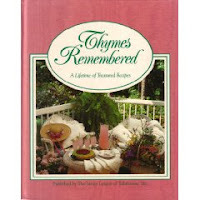 It's adapted from Thymes Remembered, a cookbook first published by The Junior League of Tallahassee in 1988. I love Junior League cookbooks and have accumulated several over the years. The recipes are well-tested and the collections often include regional dishes. I've tried many and have yet to be disappointed. This is comfort food weather. Bone-chilling cold, wind...and snow. We're closing in on 100 inches so far this season, and should surpass our 120 inch average well before the end of the month. The girls had a late practice yesterday and I was thinking about making them a snack, when Nan posted a recipe for Maple-Oatmeal Muffins. We all love this combination, so I knew these would be a hit. There was a batch in the oven within half an hour. I intend to finish all of these books. My dilemma is to figure out the best way to accomplish this. Since I just started The Way We Live Now in October, I'll finish that first. Should I continue reading a chapter or two every few days, or perhaps designate one day a week as my "classics day"? I'll try both and see which works better. The other books pose a different problem. What if I can't remember what Becky Sharp or Dorothea Brooke have been up to? I'm afraid I may need to start skimming those from the beginning. Well, at least I can be assured this pile will not grow - I'm no longer active in the group. There was a package from England waiting for me when we got home from Maine last week. I won a copy of The Secret Scripture from Lynne (and Rocky) at dovegreyreader scribbles! Sebastian Barry is an author I've been meaning to read for some time. The Secret Scripture was at the top of my Christmas list, and Annie Dunne and A Long, Long Way are both on my wish list. Now I don't have to wait any longer. Thanks, Lynne! I've been cautiously eyeing the many challenges swirling around the internet the last few weeks. Since my 2008 resolution was to take the pressure out of reading, I hadn't signed up for any. My only real challenge, or commitment, has been to read all the books for my f2f group. 2009 will be different! I have signed up for Wendy's (Caribousmom) 2009 Mini Challenges. As I complete each challenge, I will add a link to its corresponding blog post.